The 49.5-meter tall Soyuz FG made an on-time blastoff at 8:05 UTC; 2:05 p.m. local time, powering into cloudy skies over the Site 31/6 launch pad to start a high-speed pursuit of the orbiting complex. Embarking on its 57th flight, Soyuz FG swung to a north-easterly flight path and dropped its four liquid-fueled boosters two minutes into the flight. The payload shroud fell away two and a half minutes after liftoff and the powerful core stage handed off to the Block I upper stage at the four-minute and 47-second mark for the final push into orbit. Soyuz MS-02 was sent on its way nine minutes after launch, marking the start of a two-day rendezvous with the Space Station for rookie Soyuz commander Sergei Ryzhikov and veteran Flight Engineers Andrei Borisenko and Shane Kimbrough who both visited ISS before. The successful launch of Soyuz MS-02 increased the population living off the Earth to eight with an international crew trio living aboard ISS, the inbound Soyuz crew set for docking on Friday, and a pair of Chinese Astronauts who took up residence aboard the Tiangong-2 space laboratory on Tuesday for a month-long research mission. Soyuz MS-02 is the 131st flight of a Soyuz vehicle, but only the second of the upgraded MS series of spacecraft that feature a number of new systems to keep up with the current state of technology. The MS upgrade previously flew on three Progress cargo missions and Soyuz MS-01 launched in July, but to complete more in-flight testing, the MS-02 mission will stick to the two-day rendezvous scheme, requiring the crew to spend two nights in the confines of the Soyuz before upgrading to the comforts the Space Station has to offer. 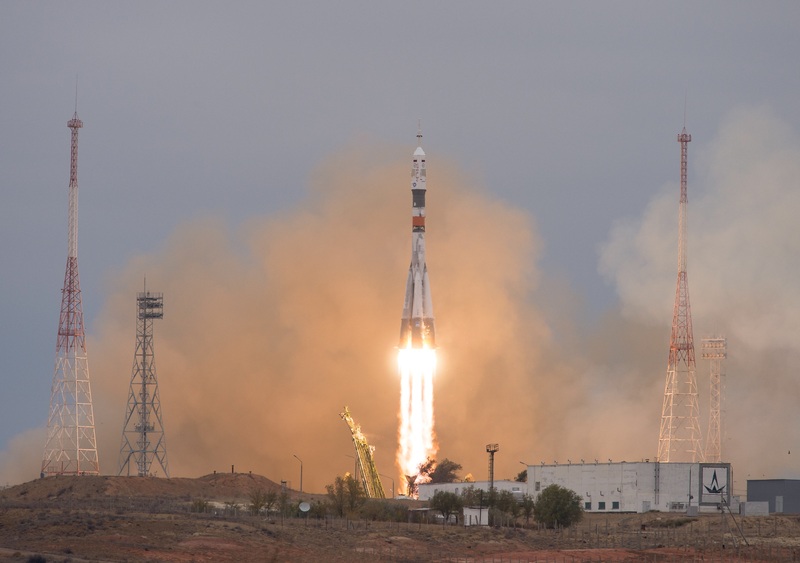 Wednesday’s launch came after a four-week delay caused by an electrical short discovered aboard the Soyuz spacecraft just six days prior to its original September 23 launch target. Teams traced the short back to a burnt out cable inside the Entry Module which required replacement followed by extensive re-testing to ensure the short did not harm any other electrical systems. 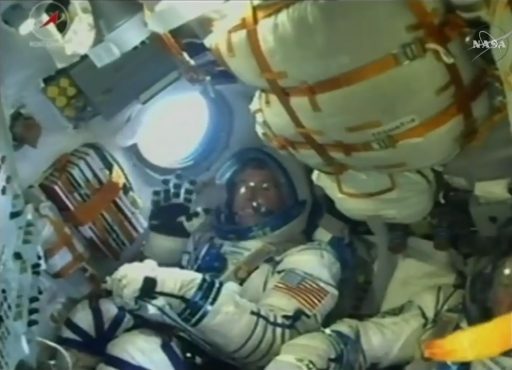 The three crew members were sent back to Moscow after it became clear the launch would need to move to the very end of the current ISS launch window. 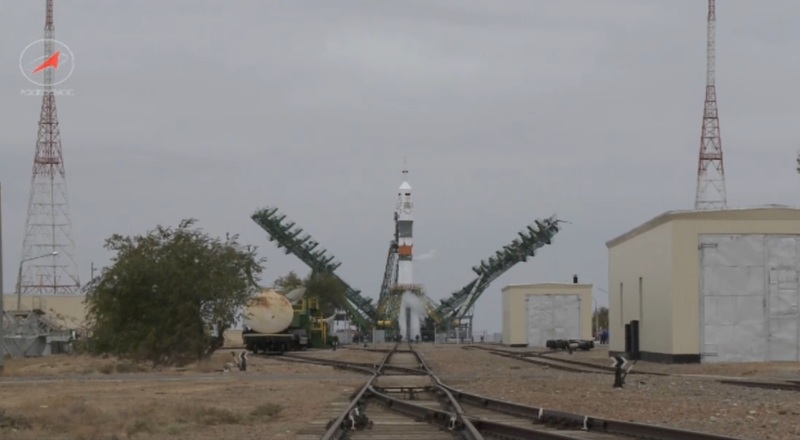 They returned to Baikonur on October 7 to re-start the final pre-launch flow in a well oiled machine of human spaceflight operations at the Cosmodrome. The Soyuz rocket was wheeled out to Site 31/6 on a crisp fall morning on Sunday to enter a comprehensive testing campaign before being readied for its eight-hour countdown sequence. Crewed Soyuz launches from Baikonur typically use the Site 1/5 launch pad that supported over 500 missions since the dawn of the space age including Yuri Gagarin’s flight in 1961. With the 1/5 pad unavailable due to ongoing maintenance and outfitting, this and the next Soyuz revert to the 31/6 pad that has been in operation since 1961 and supported a number of crewed missions in the 70s and 80s, though in recent years, only the Soyuz TMA-06M and TMA-15M utilized the launch pad. 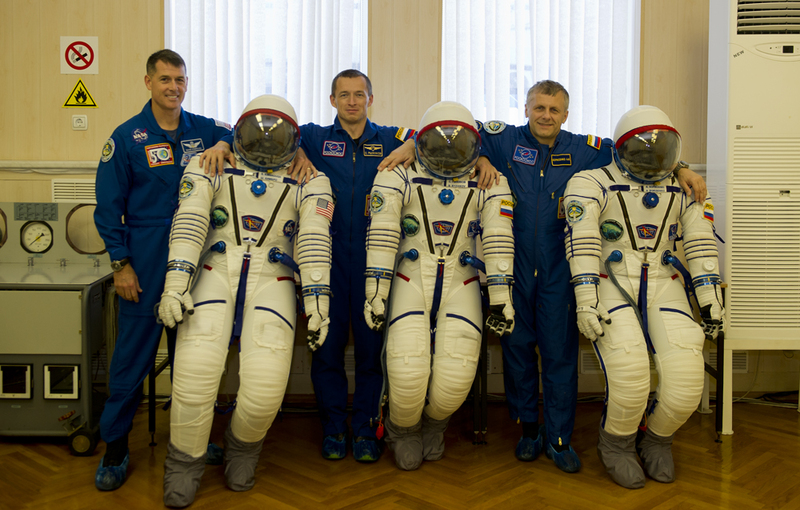 The use of Site 31/6 required some changes to the crew’s countdown timeline, specifically an earlier wake-up time to bring the entire countdown operation forward by around half an hour to facilitate the longer bus ride from the suit-up facility. 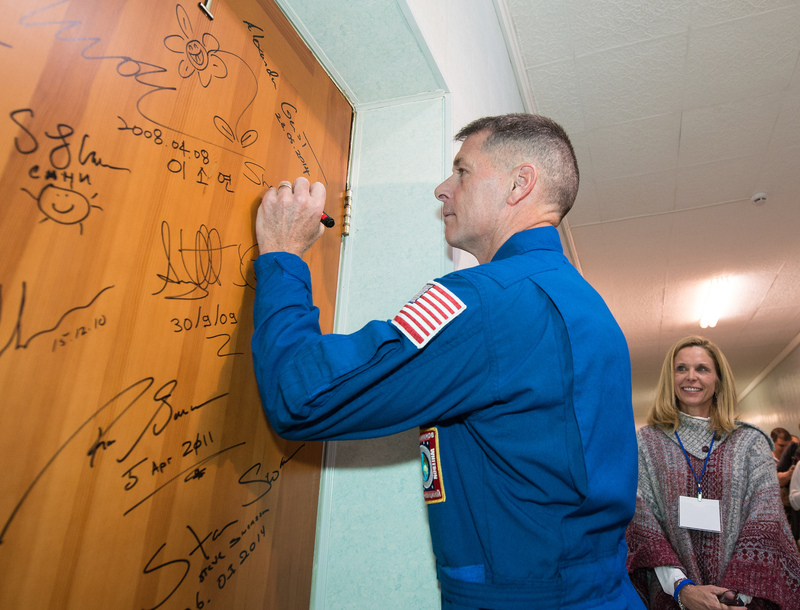 The trio got up up around 4:15 a.m., going through the usual pre-launch routine at the Cosmonaut Hotel including the traditional door-signing and the pre-flight blessing given to the crew by an Orthodox Priest. Ryzhikov, Borisenko and Kimbrough departed the hotel six and a half hours ahead of launch to head to Site 254 where they ingressed their Sokol Launch and Entry Suits and said good-bye to their families and friends who came to Baikonur to see them off. Out at the Launch Pad, Soyuz entered its two-hour tanking process just inside L-5 hours after clearance was given by the State Commission – starting with filling the Soyuz with Kerosene fuel and chilling down the Liquid Oxygen System before the -183°C oxidizer started flowing into the vehicle four hours and 20 minutes ahead of launch, along with liquid Nitrogen loaded into the boosters and core to act as tank pressurization gas during flight. Working at the base of the rocket, engineers hooked up loading equipment to fill the boosters and core with Hydrogen Peroxide which drives the turbopumps of the four-chamber engines. Tanking was by the book and its completion cleared the way for the crew’s arrival at the launch complex two and a half hours before launch. 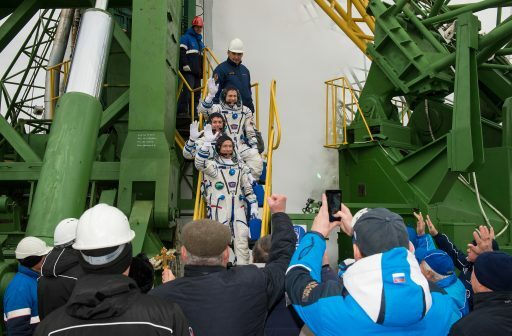 The trio waved good-bye from the Service Structure stairs and took the elevator to the tip of the rocket to take their seats atop 274 metric tons of explosive propellants. 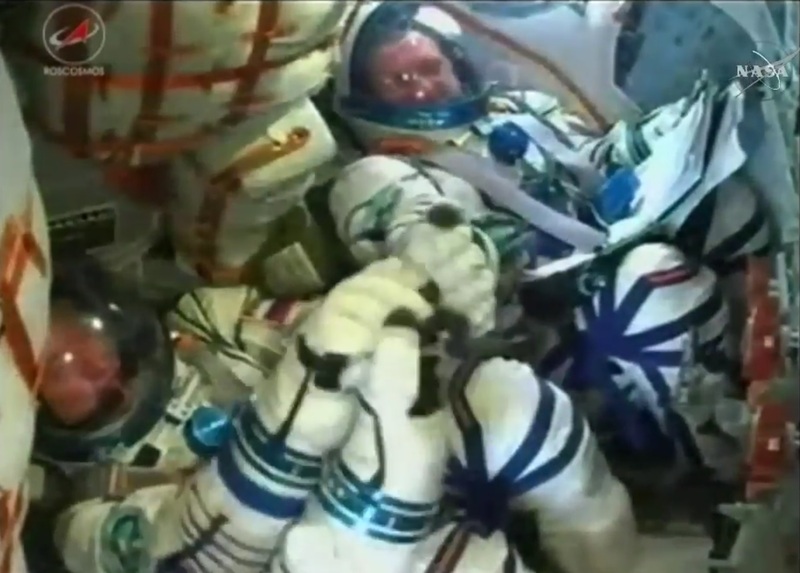 Sergei Ryzhikov boarded the center seat of the Soyuz flanked to his left by Andrei Borisenko and to the right by Shane Kimbrough. Ryzhikov, the only crew member without flight experience, comes from a military background, serving as a pilot in the Russian Air Force before being selected as Cosmonaut in 2006. In the Russian crew selection system, Cosmonauts with a military background are given priority for the commander’s position even if they do not have prior flight experience. Andrei Borisenko, a trained aerospace engineer, worked at the Russian Mission Control Center supporting Mir and ISS flight operations before being selected in 2003. He spent 164 days in space in 2011 as part of Expedition 27/28 and will add 130 days to his record during Expedition 49/50. NASA’s Shane Kimbrough also visited the Space Station once before, flying 16 days on Space Shuttle Endeavor on mission STS-126 in 2008 during which he participated in two of the mission’s spacewalks dedicated to the assembly of the ISS complex. With the crew strapped into their seats, ground crews sealed off the Soyuz spacecraft to clear the way for leak checks and the crew’s pre-launch checklist, keeping them busy to fully check out their Soyuz and configure the spacecraft for liftoff. 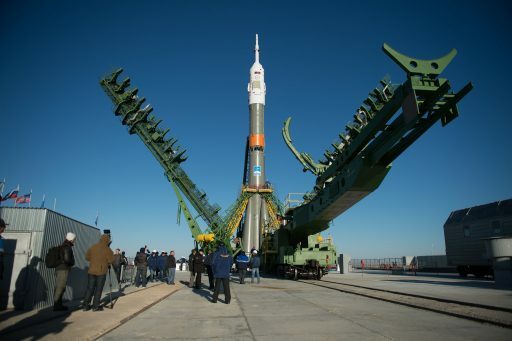 The Soyuz FG rocket was revealed 40 minutes before launch when the two Service Structure Halves retracted to their launch position, marking the start of the final preparatory steps for launch including the transfer to internal power on the spacecraft and the arming of the Launch Abort System. A relic from a previous career of the Soyuz rocket, the physical launch key was inserted by officials at T-6 minutes, formally authorizing the countdown to enter its automated sequence – a highly choreographed series of steps to pressurize the vehicle’s tanks, purge the engines, and transition the rocket to battery power. 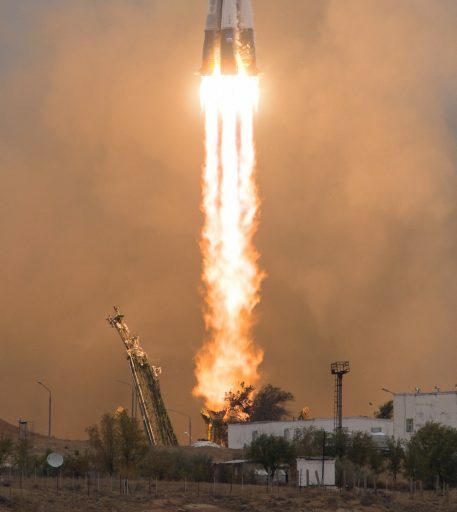 The umbilical towers swiftly retracted from the rocket and the engines were fired up at T-20 seconds to soar to a total thrust of 422 metric tons, overcoming counterweights and lifting the Soyuz with an initial thrust to weight ratio of 1.36. Building on Sergei Korolev’s decades-old R7 design, Soyuz has completed over 1,800 flights, becoming a world leader in terms of flight heritage and launch rate so far unparalleled by any other rocket family. Powered by its four boosters and core stage – all outfitted with four-chamber engines and smaller steering jets – Soyuz lifted off at precisely 08:05:14 UTC, thundering off its launch pad and balancing in an upright posture for ten seconds ahead of the pitch-over to a north-easterly departure path – flying toward the Russian-Kazakh border. Soyuz encountered Maximum Dynamic Pressure at T+49 seconds, accelerating through Mach 1 just after the T+1-minute mark, its engines guzzling down 1,600 Kilograms of propellant each second of powered flight. The Launch Escape Tower fired its separation motors one minute and 54 seconds into the flight to pull away from the ascending rocket which by that point had switched to its mid-altitude abort mode in an architecture that provides abort options from before launch all the way through orbital insertion. For the unlikely event of an abort, 11 recovery teams were stationed along the rocket’s ground track from Baikonur to the Pacific Ocean. The four boosters commanded their RD-107A engines to shut down at T+1 minute and 58 seconds after each consumed 39,600 Kilograms of propellant to lift the Soyuz to an altitude of 49 Kilometers and a speed of 1.5 Kilometers per second. Separation was accomplished with pyrotechnics and pistons, sending the 19.6-meter long boosters into a tumble toward a crash landing 348 Kilometers from the Soyuz launch pad. After separation of the boosters, Soyuz continued powered ascent relying on the core stage alone – generating 102 metric tons of thrust when flying through the rarefied upper atmosphere. Passing through 85 Kilometers in altitude, Soyuz dropped its launch shroud two minutes and 33 seconds into the mission, offering the right and left seaters a first look at Earth through the small Entry Module windows while the rocket continued speeding towards orbit. Over the next two minutes, forces on the three crew members steadily increased as the launch vehicle got lighter while the 27.8-meter long core stage continued firing on all cylinders, burning 91,000 Kilograms of LOX and Kerosene over the course of its operation. Forces peaked at 3.5Gs before the crew was catapulted towards the instrument panel at the moment the engine was cut off four minutes and 45 seconds into the flight. 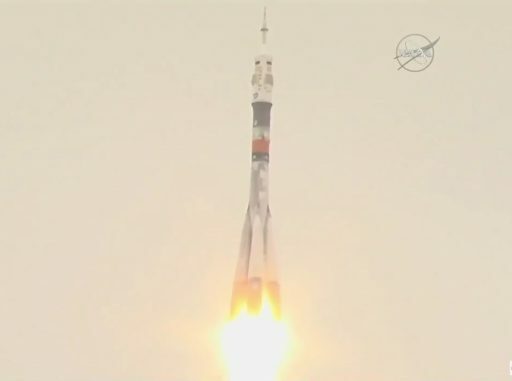 At the end of the core stage’s burn, Soyuz had reached an altitude of 160 Kilometers, traveling 3.9 Kilometers per second. Separation of the core was completed in hot-staging mode commencing two seconds after cutoff with the ignition of the RD-0110 engine of the Block I upper stage followed moments later by the firing of the pyrotechnic separation system to allow the third stage to pull away from the spent core, set on a course to impact 1,550 Kilometers from Baikonur. 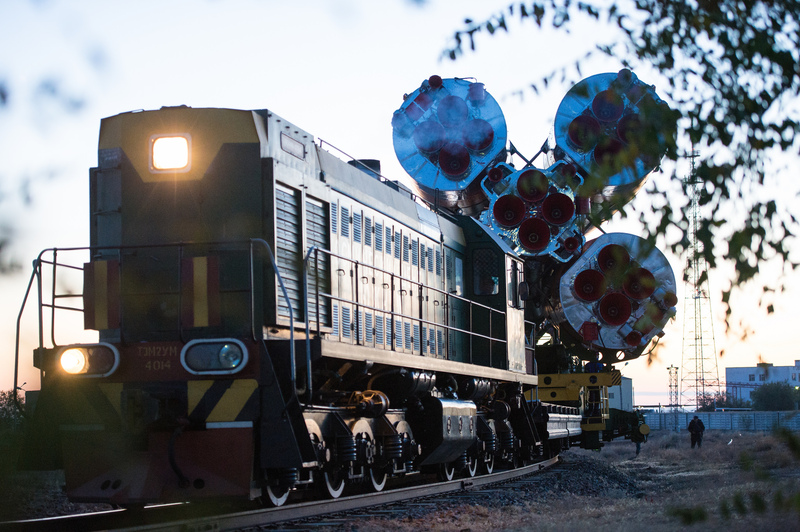 Soaring to 30,400 Kilogram-force of thrust, Block I was tasked with raising the vehicle’s velocity by nearly 4 Kilometers per second to lift Soyuz MS-02 into the standard insertion orbit of 200 by 242 Kilometers, inclined 51.66° from where it will be up to the spacecraft to link-up with ISS in its 400-Kilometer orbit. Suspended on a white and blue ribbon, Federatsiya started floating to confirm the spacecraft had indeed reached space. The mascot for this mission was chosen because the new Soyuz MS spacecraft introduces systems that will also be used on the next generation vehicle, currently expected to begin flying in the first half of the next decade atop a human-rated version of Russia’s Angara rocket. Federatsiya, like NASA’s Orion, is designed to take humans beyond Earth orbit, unlike the Soyuz spacecraft that has been optimized to efficiently ferry crews to and from Low Earth Orbit and will do so again with the Expedition 49/50 crew. Soyuz MS-02 – flying under the call sign Favor – separated from its carrier rocket three seconds after engine cutoff and immediately deployed its power-generating solar arrays and KURS antennas. 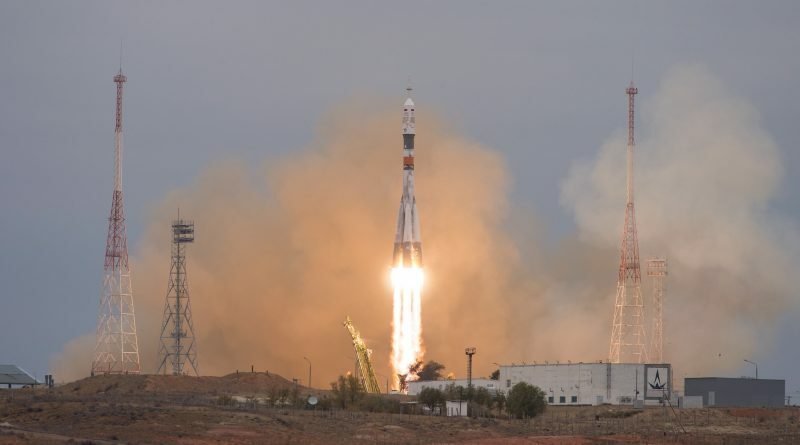 Control of the Mission was handed from the Launch Bunker to Mission Control Moscow where all eyes were on the data displays showing Soyuz completing its first steps in orbit. 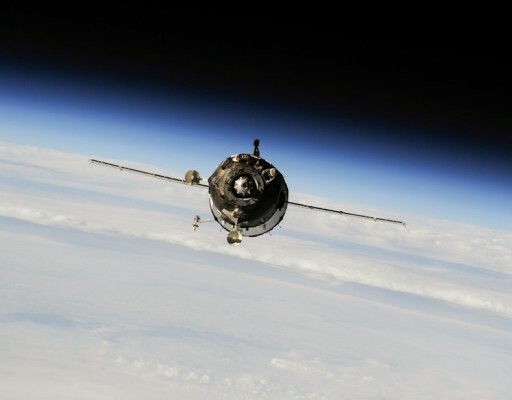 Good deployment of the arrays and antennas was confirmed and Soyuz proceeded with the automatic pressurization of the spacecraft’s unified propulsion in preparation for activation of the DPO thrusters to null out body rates and position the Soyuz for optimized power generation, tasks completed on the first orbit of the mission. In for the long rendezvous, the crew was given a GO to open their helmets and prepare for ingress of the Orbital Module where they will take off their suits and get settled for their two-day orbital link-up with the Space Station. A pair of orbit-raising burns are planned for the mission’s third orbit with a fine-tuning maneuver on Thursday to put the Soyuz on the correct trajectory to catch up with ISS from behind and below. The automated rendezvous sequence will be started Friday morning to take the Soyuz through a series of impulse burns to arrive in the direct vicinity of the Space Station for a slow flyaround and straight-in approach to the Poisk module with docking expected at 9:59 UTC, marking the crew’s arrival for a stay of 128 days, but only a short handover as the current Station crew gears up for an early morning landing on October 30.